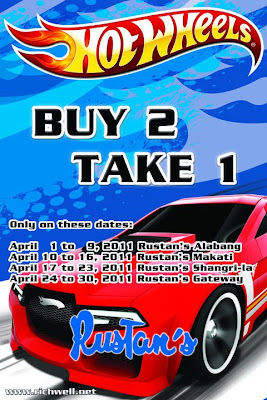 Hey kids, ask your mommies to bring you to Rustans to avail of this: Buy 2 cars and get 1 FREE Hot Wheels. Aside from that, you can participate in a head-to-head race Hot Wheels. Just present your receipt to the race marshal. WIN OR LOSE, you get a Moon Dough or Bakugan sampler FREE!